Monthly Pot-Luck Family Nights – hosted by the Parent’s Club and staff. 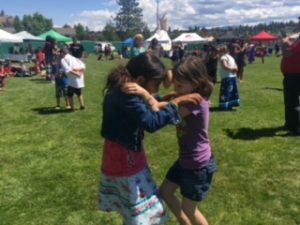 Students and families have the opportunity to come and enjoy an informal meal and participate in theme based activities often designed around deepening the understanding of the Okanagan language and culture. Sports Teams: the school offers lunchtime intramurals for students to participate in active games like basketball, volleyball, soccer and floor hockey. The school also has basketball, volleyball and soccer teams that travel and compete against the local school district elementary schools and some of the Band schools within the Valley.